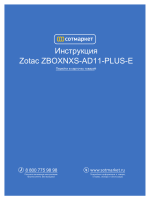 express written permission of ZOTAC. accordance with local environmental regulations. В™В™ Read and follow all instructions in the documentation before you operate your system. В™В™ Do not use this product near water or a heat source such as a radiator. В™В™ Openings on the chassis are for ventilation. Do not block or cover these openings. objects of any kind into the ventilation openings. В™В™ Use this product in environments with ambient temperatures between 0в„ѓ and 35в„ѓ. В™В™ Do not walk on the power cord or allow anything to rest on it. В™В™ Do not spill water or any other liquids on your system. cord and contact a qualified service technician or your retailer. ВѕВѕ The power cord or plug is damaged. ВѕВѕ Liquid has been spilled into the system. ВѕВѕ The system does not function properly even if you follow the operating instructions. ВѕВѕ The system was dropped or the cabinet is damaged. ВѕВѕ The system performance changes. your retailer If any of the below items are damaged or missed. The power switch turns the mini-PC ON and OFF. The HDD status indicator shows when the hard disk is transfering data. The WiFi status indicator shows when the WiFi is transfering data. The IR receiver is used to receive the signal from the IR remote control. signal to analog headphones or amplified speakers. voice narrations or simple audio recordings. Note 2: Due to the special design for easy upgrade, some connectors are placed upside down. Refer to the diagram below to identify the components on this side of the system. The supplied power adapter converts AC power to DC power for use with this jack. to the mini-PC, always use the supplied power adapter. displays such as an HDTV or monitor. maximum performance with USB 3.0 compatible devices. Connects to compatible Kensington Safety Lock. local area network (LAN) with speeds of 10/100/1000Mbps. keyboards, mice, cameras and hard disk drives. The WiFi antenna connector supports WiFi antenna module. The ventilation area is designed for cooling. BIOS settings, such as LED indicator, USB2.0 charge and CIR controller. 4. Press <Enter> and select Disabled. 5. Press F10 to save the configuration and exit. The PC will reboot. 1. In Chipset menu, select Onboard Device Config and press <Enter>. 3.Enter CIR Controller and select Disabled. 1. Remove the four screws securing the bottom cover into place. 2. Gently remove the cover from the side marked with words: Pull upward. into the slot at a 45 degree angle. bracket as shown in the image below. 2. Install the hard disk bracket to a 2.5-inch SATA hard disk with 2 screws. 3. Insert the hard disk into the socket and gently slide into the connector. 4. Reinstall the screws of the hard disk bracket. Please connect the peripherals before using the ZOTAC ZBOX nano. Connect the DisplayPort connector to the DP port. Connect Kensington Safety Lock to ZBOX nano and lock. mouse devices and printers to the USB 2.0 ports. Connect a WiFi antenna module to the WiFi antenna connector. then press the power switch on the front panel to turn on the system. and the other end to a HDMI-compatible display such as an HDTV or monitor. the other end to a network hub, switch or router. Connect one end of an eSATA device to the eSATA port. front of the ventilation holes. The ZOTAC ZBOX nano is monitor-mountable using the included VESA mount. 1. Secure the VESA mount to the LCD monitor using screws (not included). 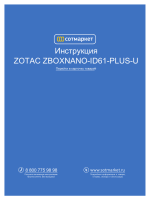 Disclaimer: ZOTAC cannot be held liable for damages resulting from an improper installation. 2. Align the ZOTAC ZBOX mounting holes to the VESA mount attachment pegs. the ZBOX to the mount. 3. Connect the ZOTAC ZBOX nano to your LCD monitor with an HDMI/DP cable. from DVD before you use the IR receiver. 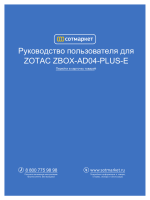 ZOTAC ZBOX nano is designed to meet MCE standards. 3. Gently press down on the CR2032 lithium cells, and reinstall the rear cover. 1. Insert disk for operating system into the optical drive. 2. 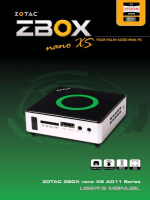 Wait for the ZOTAC ZBOX nano to boot from the disk. 3. Follow the onscreen directions to install the operating system. main menu will show up automatically. Select the driver you want to install. The driver installer should launch. Follow the onscreen instructions for the selected driver to install. 3. After connection was established, you will see вЂњConnectedвЂќ. Note 2: Enter the network security key if necessary. 4. Select вЂњUse the following IP addressвЂќ. 6. Enter the preferred DNS server address if necessary. 7. After entering all of the related values, click вЂњOKвЂќ to finish the configuration. Repeat Step 1-3 in the previous section. Select вЂњObtain an IP address automaticallyвЂќ and click вЂњOKвЂќ. Click вЂњCreate a new connectionвЂќ to start the NEW Connection Wizard. Select вЂњConnect to the InternetвЂќ and click вЂњNextвЂќ. вЂњConnectвЂќ to connect to the internet. Note: Contact your internet Service Provider (ISP) if you have problems connecting to the network. 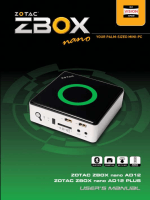 ZOTAC ZBOX nano to a TV or receiver via HDMI. 1. Access the Sound settings via the system Control Panel. 2. Under Playback devices, click вЂњAMD HDMI OutputвЂќ. 3. Click the вЂњSet as DefaultвЂќ in the lower right hand corner. 4. Click вЂњOKвЂќ to exit the setup.